A birds' stomach consists of a cranial part or glandular stomach (proventriculus) and a caudal part, the muscular stomach or gizzard (ventriculus). The glandular stomach has a narrow lumen and a spongious wall full of strongly developed glands. These glands (glandulae proventriculares) are organized into lobules, separated by scarce dense connective tissue. The central part of each lobule consists of a secondary glandular excretory duct. Tubular end pieces lie radially arranged around this central secundary duct, ending into it by small tertiary ducts. 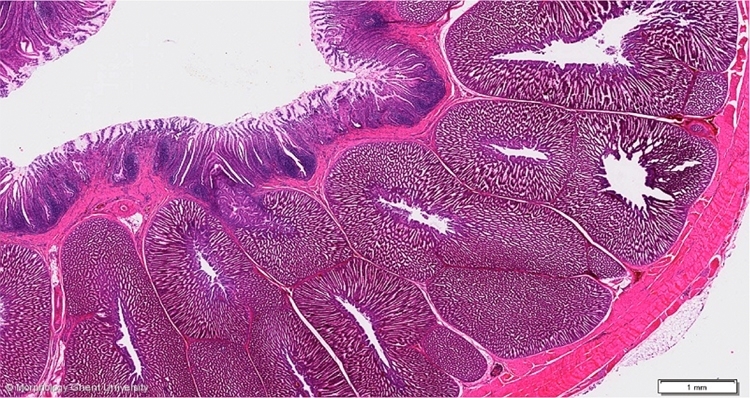 The secondary ducts of several lobules join together to form a primary duct that opens into the lumen on a raised mucosal papilla.